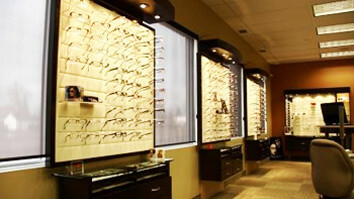 At Lakeland Family Eyecare, our mission is to deliver excellence in eyecare and eyewear services. Lakeland Family Eyecare was founded by St. Paul native Dr. Trevor Pilipchuk in 1998. Dr. Neil Hodinsky, also born and raised in St. Paul, joined our practice in 2010 and became a partner in 2012. We have a unique perspective of the needs of our patients that could only come from having being born and raised here. Our clinics are set up to provide excellent eye care. We take great pride in being able to save our patients unnecessary trips to Edmonton- save the long drive, come see us instead! We love to educate children on their eyes and how to care for them. As they grow, their eyes will play an instrumental role in how they play and learn. Kids under 5 get a free pair of sunglasses as part of how we educate and protect against UV radiation. We also have a comfortable play area and movies to keep your kids happy while you have your eye exam done, try on some new frames, or finalize prescriptions. We led the technological charge when we were one of the first Optometry practices in Alberta to use digital retinal photography, and we are once again on the forefront of diagnostic technology having integrated OCT Imaging into our eye examination process. We invest in new technologies so that we can gain a clear picture of your eye health with a level of accuracy and detail unlike anything possible without it. Since our founding in 1998 we have supported over 40 local associations and clubs in Bonnyville and St. Paul. We believe in the importance of great community values; supporting and taking part in local events and charitable causes is something we love to do. Find us on the corner of Main & 52nd St., across from the Nicks Lounge restaurant. Located on 51st Ave next to the Fire Hall. Lakeland Family Eyecare is now proudly certified as Care1 Integrated Clinic - which allows us to provide the highest standard of eyecare to our patients, by offering the most advanced technology and equipment. All of our Optometrists and staff have completed special training dedicated to the collaboration and communication with Ophthalmologists (medical doctors and surgeons who specialize in the eye) using telemedicine, to manage advanced and complex eye diseases. With modern technology, almost all parts of the human eye can now be photographed. Using Care1, Lakeland Family Eyecare's Optometrists and staff can provide these images electronically to an Ophthalmologist for diagnosis and recommendations on treatment. What are the benefits of Care1? What conditions can be seen with Care1? Learn more about Care and telemedicine here. Save the long drive to Edmonton for something else! Our referring Ophthalmologist visits our clinics every month to provide cataract surgery assessments to our patients. The surgery is then booked in a nearby community in a comfortable and caring medical facility with no need to travel to Edmonton. Save a few hours of driving and have your cataract assessments done here. Did you know that up to 75% of vision loss is preventable? Did you also know that vision loss is almost always permanent? We believe in catching developing problems before they become a problem. For most people, an annual eye exam is all it takes to keep an eye on your… eyes.